With Zoofest 2018 all wrapped up, we give a quick recap on all the great bands that occupied 14th St. Friday and Saturday. Evan Bartels performs at Zoofest in Lincoln, Neb., on July 6, 2018. Kayla Solorzano/KZUM. 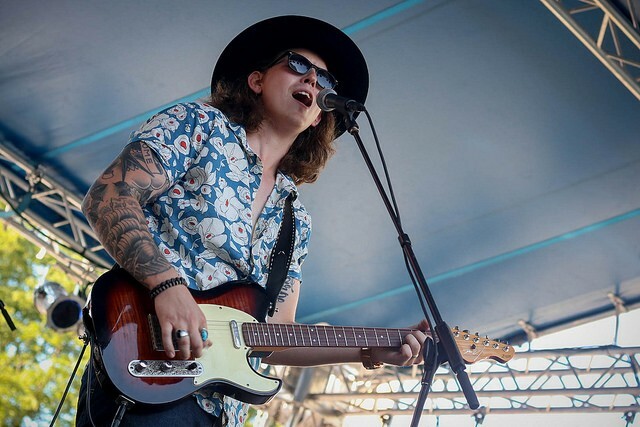 Zoofest opened with local singer/songwriter Evan Bartels and his band the Stoney Lonesomes, who certainly set the tone for what became an amazing two nights of blues, rock and country music. The group, completed by Logan Bartels, Jake Brandt and Bryan Keeling, was once again an amazing performance to see live, with Bartels on top of his game both lyrically and instrumentally. The band played flawlessly together as they navigated through classic covers and originals from their 2017 album The Devil, God & Me. While the crowd at Zoofest started out small for the band’s 5 p.m. Friday evening set time, by the end of their third song, people were arriving and already starting to crowd the front of the stage. 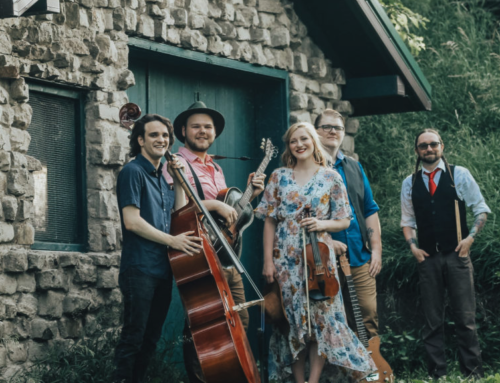 Bartels and his unique brand of Americana, small town storytelling fit perfectly for the outdoor stage of 14th Street, and for the group’s first time at Zoofest, it was a great way to start a potential continued history at the festival. Lil Ed and the Blues Imperials perform at Zoofest in Lincoln, Neb., on July 6, 2018. Kayla Solorzano/KZUM. In place of Lil Ed Williams’ iconic fez hat was something even more quintessential – a KZUM bucket hat, which, unbiasedly, looked pretty good on him. 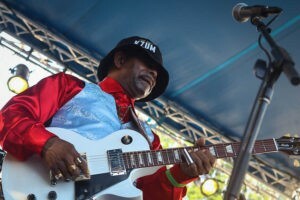 After Bartels and crew warmed the crowd up and filled the streets, Williams and his band the Blues Imperials took to the stage at 7 p.m. and delivered a happy, grooving set that perfectly fit the atmosphere of the setting sun and Zoofest. 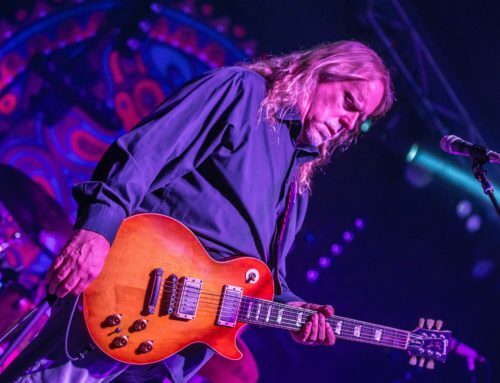 Alongside Williams were James “Pookie” Young, Mike Garrett and Kelly Littleton, and together the four of them put on a tremendous, high-energy show filled with Chicago blues tunes. 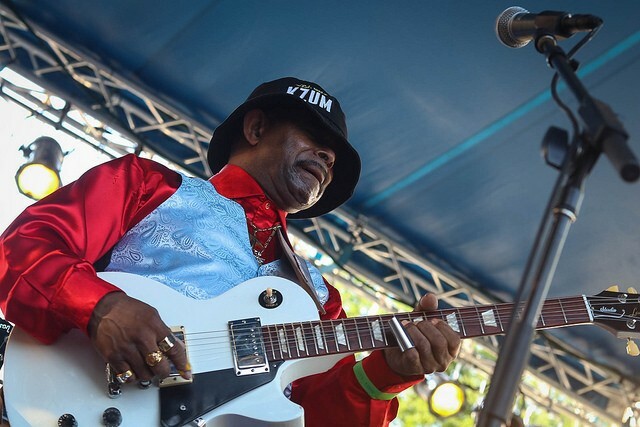 Williams’ impeccable slide guitar solos turned everyone in the crowd into “Ed Heads” as he interspersed expert solos between many catchy songs that had many on their feet and dancing. Lil Ed is no stranger to the Zoo Bar and the blues atmosphere of Lincoln, and Friday night’s performance showed that both he and the Lincoln audience remembered that as he played a one-of-a-kind contemporary blues set. David Hidalgo of Los Lobos performs at Zoofest in Lincoln, Neb., on July 6, 2018. Kayla Solorzano/KZUM. The band from East L.A. that everyone was eagerly anticipating arrived on stage a little past 9 p.m. Friday night. Although Los Lobos was formed over 40 years ago, the group sounded as though they hadn’t lost a single step as they put on a memorable performance at Zoofest 2018. This was true even without bassist Conrad Lazano, who had to head home at the last minute. Patrick Recob, of Kansas City, filled in on short notice and did so very well. Many who had attended previous Zoo Bar festivals said they’d never seen the crowd as large as it was for the Los Lobos set, and it definitely looked that way. With half the block standing up near the stage and the other half sitting behind them in chairs, the entire block of 14th Street was seemingly packed with people. 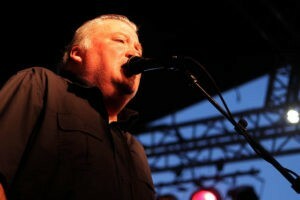 With an incredibly large repertoire of songs to choose from, Los Lobos spent much of their set performing classic blues and rock ‘n’ roll songs that included both legendary covers and originals. While some said their chosen songs weren’t as chicano rock as they were expecting — due to Lozano’s unplanned absence — Los Lobos’ expert performance of blues rock songs fit perfectly with the ambience of Zoofest. The crowd loved every minute of it, and of course, for their encore, Los Lobos couldn’t leave without playing their famous rendition of “La Bamba.” Overall, this was an awesome set from an awesome band. 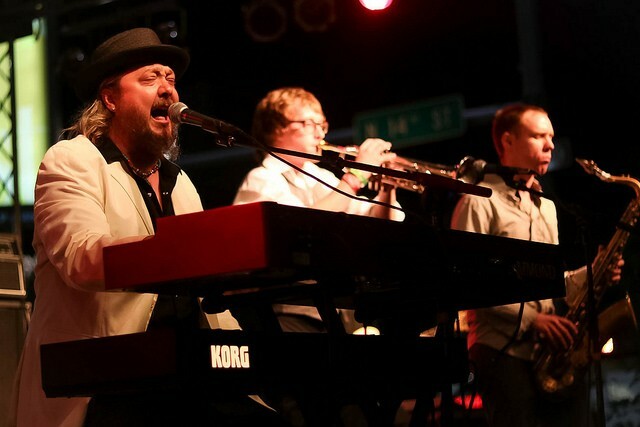 Josh Hoyer & Soul Colossal performs at Zoofest in Lincoln, Neb., on July 6, 2018. Kayla Solorzano/KZUM. For many, following up Los Lobos would be a stressful experience. For Lincoln’s very own king of soul, it was an opportunity to blow the proverbial roof off the first night of Zoofest and bring Friday night home with a bang. Soul and funk man Josh Hoyer brought an amazing show to the festival a little past 11 p.m. Friday night, accompanied by his band Soul Colossal. With a lively horn section, burning rhythm section and Hoyer’s trademark brand of bright keys and colossal vocals, the group took over the stage and put on one of the best performances of the entire festival. Beautiful, dissonant trumpet and saxophone solos at the beginning of their set kept the energy high as Hoyer powered through original songs that included his own satisfying keys solos and one-of-a-kind voice. Many from the Los Lobos crowd stayed to listen and dance to Soul Colossal, and their show was a perfect way to end one of the largest nights in Zoofest’s history. The first Blues Ed band, Far & Wide, kicked off Saturday with some amazing covers of classic blues songs to begin the last day of Zoofest. Composedof middle and high school students, the large group featured Elaina Clement and Chloe Moore on vocals, Arich Freuhling on saxophone, Jacob Clarys on trumpet, Evan Johnson and Cooper Watkins on guitar, Bryn Groenjes on keys, Griffin Gillen on bass and Drew Schilken on drums. While they were the youngest blues band at the festival, you couldn’t tell from their playing. Every member of Far & Wide was great, with impressive vocal performances from Clement and Moore alongside killer solos from Johnson and Watkins that certainly betrayed their age. 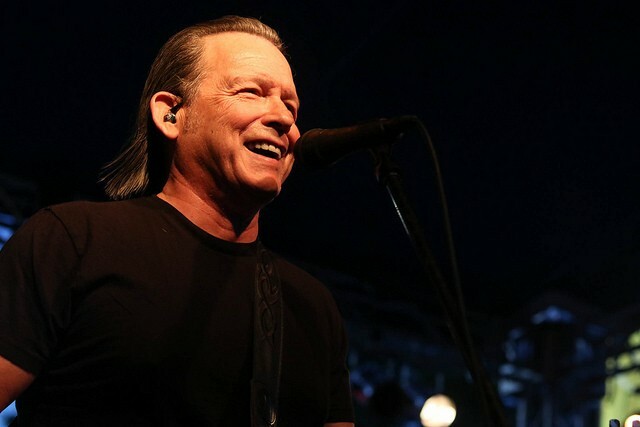 Freuhling was a master on the keys who could seemingly keep up with any other bands at Zoofest, and the horns and rhythm pairs of Clarys and Freuhling and Gillen and Schilken provided that perfect next step for an awesome, full blues sound. The future of blues in the state certainly looks bright as these players only continue to get better and better. The second Blues Ed band, Mannix, took the stage an hour after Far & Wide at 2 p.m. and didn’t miss a beat. Led by singer Maia Ramsey, the group was completed by Seth Andre and Will Gades on bass and guitar, and Ry Steffan on drums and percussion. Compared to the first Blues Ed band, Mannix definitely had a more pronounced rock ‘n’ roll vibe within their blues and soul tunes. 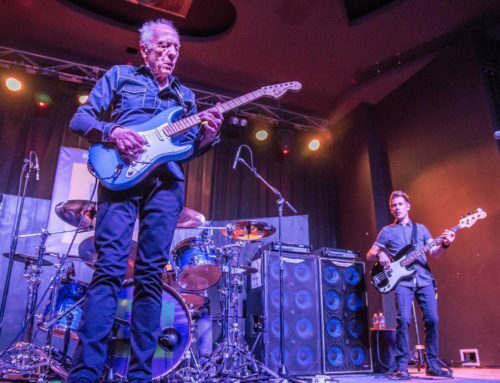 With great covers of blues-roots songs from Jimi Hendrix and Led Zeppelin, the group belted out hard chords and steady rhythms underneath Ramsay’s unique vocals – a voice made for the blues. Andre and Gades were exceptional as they took turns on both bass and lead guitar, laying down accurate bass lines and performing splitting solos. Steffan also had a clear control over the kit as he navigated the toms on songs like “Wipeout.” Again, the future of blues in Nebraska is in safe hands with up-and-coming players who already have such a firm grasp on the art and culture of blues. Award-winning local blues musician Hector Anchondo took his trio on at 3 p.m. and provided a world-class performance of many original blues songs. Anchondo, who’s performed with numerous famous bands, put on an incredible show of expertise as both a singer and guitarist Saturday afternoon with a mixture of strong, powerful vocals and lightning quick, melodic guitar solos. Anchondo was certainly one of, if not the, best best soloists at the festival. He and the band also performed many original songs from Anchondo’s critically acclaimed 2017 album Roll the Dice, where Anchondo displayed his songwriting prowess with both slow and fast-paced songs. Through rapid solos and fiery blues lyrics, Anchondo and his band started to draw some to the front stage to dance despite the heat and humidity. Overall, Anchondo put on a fantastic set and proved why he’s an award-winning blues musician who is rising to the top. Igor and the Red Elvises perform at Zoofest in Lincoln, Neb., on July 7, 2018. Kayla Solorzano/KZUM. One of the more unique bands at Zoofest, Siberian surf rock band The Red Elvises played a number of fan-favorite songs focused on beer, bacon, pizza and everything in between. The Red Elvises quickly packed the front of the stage for the 5 p.m. set and had everyone singing, dancing and clapping along to most of their songs. Their set also featured an awesome drum solo from Guevera, who took over the stage and rocked the kit while the other band members left and took a break. Everyone was also a multi-instrumentalist and singer, with members switching instruments and taking turns singing their own songs. While some songs were serious, all of them were incredibly fun to listen and sing to. The Red Elvises were a breath of fresh air from all the blues at the festival, and their spot in the lineup fit perfectly to rile up the crowd. 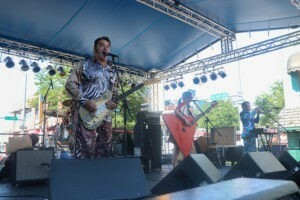 Awesome music and awesome personalities from The Red Elvises from Russia. 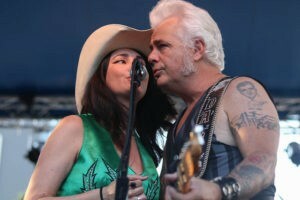 Dale Watson and Celine Lee perform at Zoofest in Lincoln, Neb., on July 7, 2018. Kayla Solorzano/KZUM. Ameripolitan, for those who don’t know, is a genre encompassing western swing, honky-tonk, rockabilly and outlaw. Dale Watson, who coined the term, and his Lone Stars are the epitome of this genre and should be the “go to” option for any true country lover. With a bottle of his favorite beer, Lone Star, in his pocket and shot a tequila for the band, the show was truly ready to start. “Jonesin’ For Jones,” was one of the many songs that the crowd knew every word to and got the crowd dancing around the stage. Special guest, Celine Lee, joined the band on the stage to sing her song, “Sayonara Sucka” from her self-titled album. Another song that was accompanied with singing, hootin’ and hollerin’ from the crowd is “I Lie When I Drink.” Watson played took suggestions from the crowd, from a favorite song an audience member suggested to his manitidory Merle Haggard song. He claimed that at every show he will always do a song in honor of the country legend. The audience unanimously cheered for Watson to play “Working Man Blues,” by Haggard. Much like Haggard, Watson played a Telecaster, however, his is decorated with coins from around the world. Tommy Castro performs at Zoofest in Lincoln, Neb., on July 7, 2018. Kayla Solorzano/KZUM. As the sun was setting, the blues rock four-piece from California took the stage. With such awards as BB King Entertainment of the Year and many more, the anticipation for the performance was high. Tommy Castro sang lead and played guitar, Randy McDonald on bass, Bowen Brown on drums and Michael Emerson on keys. 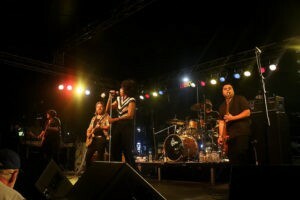 The band expressed their excitement of playing Zoofest with Castro claiming he “had recently been dreaming of playing at the Zoo Bar” and McDonald showing love having “played at the Zoo Bar for about 35 years.” Castro even borrowed a hollow-body Epiphone from Benji Kushner, guitarist for Josh Hoyer and Soul Colossal. “With 25 plus years, i have too many songs. A good problem to have but hard to decide which ones to play” said Castro. The group played both older songs like “Can’t Keep a Good Man Down” and songs off of their recently released album, Stompin’ Ground. From touring around the world relentlessly, the guys still got the packed streets of 14th to sing along and dance. McDonald and Castro were also “gettin down” to the music while Emerson and Castro traded off between high-energy riffs before coming back together. As a Lincoln and Zoo Bar favorite, it comes as no surprise that the blues community will anxiously be waiting for their return. Nikki Hill performs at Zoofest in Lincoln, Neb., on July 7, 2018. Kayla Solorzano/KZUM. Ending 2018’s Zoofest with music from Nikki Hill, a soulful, rock n’ roll queen. Hill has a sultry, soulful voice, reminiscent of Janis Joplin, and music that has a bluesy, rock, soul, high-energy sound, how could anyone not get up and dance. Hill gave the crowd a taste of her melting pot, music style with a swinging blues song, “Ask Yourself,” from Here’s Nikki Hill. She went on to play “Struttin” from Heavy Hearts, Hard Fists, a rock song one can’t help but jam to, with hints of blues and country intertwined. Hill said, “Let’s play some rock and roll for ya. That’s what we’re here for!” before jumping into her next song. “Right on the Brink” is one of the last songs she played for the crowd, leaving them wanting more, which she obliged with an encore. Hill and the band have an infectious and vivacious way of playing that one can’t help but smile, dance and want more. With promises of coming back to Lincoln soon, if anyone missed out, don’t make the same mistake twice. View more photos on KZUM's Flickr. 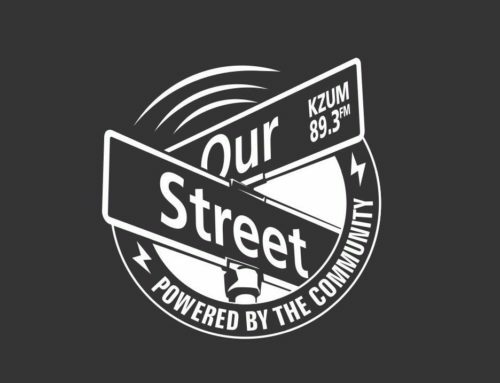 Will Roper, Brittany Ward, Joe Aguirre and Kayla Solorzano are multimedia interns with KZUM.